Polbase - Reference: Halogenated beta,gamma-methylene- and ethylidene-dGTP-DNA ternary complexes with DNA polymerase beta: structural evidence for stereospecific binding of the fluoromethylene analogues. Halogenated beta,gamma-methylene- and ethylidene-dGTP-DNA ternary complexes with DNA polymerase beta: structural evidence for stereospecific binding of the fluoromethylene analogues. Beta,gamma-fluoromethylene analogues of nucleotides are considered to be useful mimics of the natural substrates, but direct structural evidence defining their active site interactions has not been available, including the influence of the new chiral center introduced at the CHF carbon, as in beta,gamma-fluoromethylene-dGTP, which forms an active site complex with DNA polymerase beta, a repair enzyme that plays an important role in base excision repair (BER) and oncogenesis. We report X-ray crystallographic results for a series of beta,gamma-CXY dGTP analogues, where X,Y = H, F, Cl, Br, and/or CH(3). For all three R/S monofluorinated analogues examined (CHF, 3/4; CCH(3)F, 13/14; CClF 15/16), a single CXF-diastereomer (3, 13, 16) is observed in the active site complex, with the CXF fluorine atom at a approximately 3 A (bonding) distance to a guanidinium N of Arg183. In contrast, for the CHCl, CHBr, and CHCH(3) analogues, both diasteromers (6/7, 8/9, 10/11) populate the dGTP site in the enzyme complex about equally. The structures of the bound dichloro (5) and dimethyl (12) analogue complexes indicate little to no steric effect on the placement of the bound nucleotide backbone. The results suggest that introduction of a single fluorine atom at the beta,gamma-bridging carbon atom of these dNTP analogues enables a new, stereospecific interaction within the preorganized active site complex that is unique to fluorine. 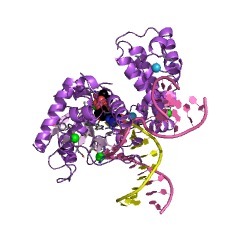 The results also provide the first diverse structural data set permitting an assessment of how closely this class of dNTP analogues mimics the conformation of the parent nucleotide within the active site complex.